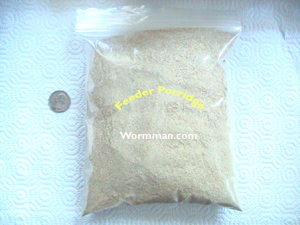 Wormman.com is rolling out it's new Feeder Porridge. This new product will provide food and water for your feeder insects. All you need to do is follow the directions on the package. The food is shipped dry and will make 20 times the size of the package you receive. For instance a one quart bag of Feeder Porridge dry mix will make approximately twenty bags wet when hydrated! 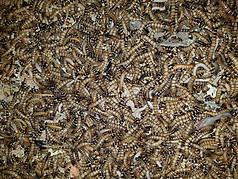 Your live crickets, mealworms, etc. will love our Feeder Porridge. Don't worry about waste because the included directions will show you how to make only what you need at a given time so that you do not have waste. The food stays dry until you are ready to feed your feeders. Great for Red Worms, Night Crawlers, Crickets, Mealworms, Superworms, Roaches, Sow Bugs, Obscure Worms and More. Compares to pet shop products that are sold in a jar. Why spend all that money when you can get the same product dry for less This product provides food and water for your insects. Product ships Monday through Thursday from the North East via USPS Priority Mail. Money back guarantee if you are not satisfied! We stand by our products. One Quart of Feeder Porridge $16.95 Delivered!! Will make approximately 20 quarts once water is added. Will make about $100 worth of the store bought equivalent. Save money and feed your feeders the very best! Directions: Add one tablespoon of Feeder Porridge to 20 teaspoons of water. Let sit for five minutes and serve in little patties. Once hydrated the food will not be too sticky and can be formed into balls or patties for feeding insects. Place only what feeders will eat in one day. Replace daily. One teaspoon of dry mix will make twenty teaspoons of porridge. Refrigerate what you do not use for the next feeding. To make less use 1/2 a tablespoon to 5 tablespoons of water! sulfate, zinc sulfate, calcium iodate, cobalt carbonate, and Polyacrylamide. 1 Pound of Dry Feeder Porridge Just $16.95 Delivered!